Claire Bowen, a haunted psychologist, devotes her life to helping troubled women rebuild theirs. But her dream of a family with her new husband, Robert, a pilot and local hero, begins to crumble as disturbing revelations from his past emerge. Detective Joe Tanner, struggling to overcome his wife's death while raising their little girl alone, heads the task force formed to stop the monster who has resurfaced with a chilling message. In the wake of five cold-case murders across Los Angeles, one of Claire's most promising patients vanishes. Gut instinct tells Tanner the truth is within his grasp, while Claire is torn between guilt and terror over what's to come. As time runs out, both are pulled deeper and deeper into an unspeakable darkness. Claire Bowen was a first-hand witness to the abusive relationship between her parents. She even saw her father kill her mother and younger brother before ultimately killing himself. She's now in a happy relationship with her husband, Robert Bowen, and dedicates her psychology practice to helping abused women. Now it appears that Claire is caught between one of her patients and her estranged abusive husband. When that patient disappears and the police launch their investigation into the patient, the patient's husband, and Claire's practice, more questions are raised than answered. Claire turns to her best friend, a private investigator, to obtain some of those answers. Will answers be found before more bodies are found? On the surface it appears that Claire and Robert Bowen have the perfect relationship. Robert is loving, attentive, supportive, and hard-working. Unfortunately the more the police search for clues into the murders and Claire's practice, the more unanswered questions arise about Robert and his background. Claire begins to suspect that maybe it isn't possible to ever fully know the person you're in love with and those questions could lead to her demise. 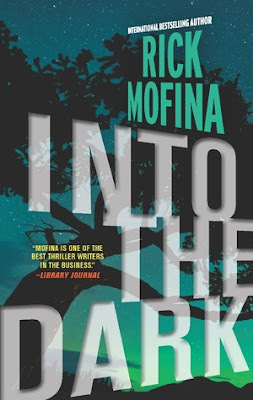 Into the Dark is a fast-paced read that pulled me in from the very beginning. I enjoyed the way Mr. Mofina revealed the warped character of the murderer layer by layer, building the suspense. Even when the murderer is fully revealed, the questions of why, how, and for how long remained. None of the women presented are weak women, but they do have moments of weakness that added to their vulnerability factor. I found all of the characters to be very well-developed and realistic, even the bad guys. If you enjoy a well-written mystery-suspense story with a dark but charismatic bad guy, then Into the Dark may be the perfect read for you.